We had some pretty funny/awesome things happen this week! To start off I learned a hilarious phrase in Samoan that means “Hey there beautiful, I’m coming after you.” (Au Lei Lei Fakali Mai Oe.). I thought at first when I heard it said that you were going to have to drop the F-bomb to pronounce the middle part, so I was kind of hesitant at first until I got it – hahaha. Oh, and did I mention that learning Samoan is awesome? Well, it is. The second thing that happened was that we finally baptized this 9 year old kid who we had been teaching since I first came into the area 9 months ago, so I was pretty happy for him. 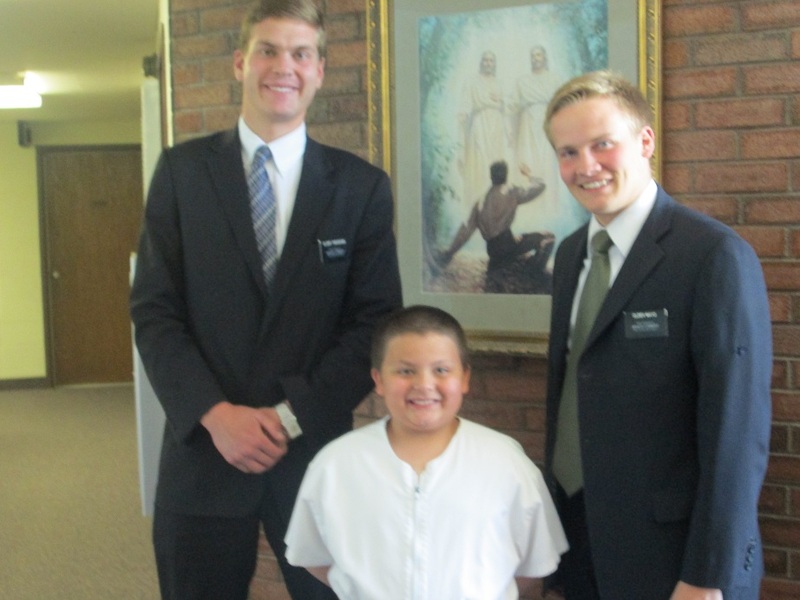 Alonzo is the type of kid who can make an extremely off the wall comment and have you laughing in a matter of seconds, or just put a blank look on your face, so all the missionaries that come into the area that have heard of him want to go to his place so they can have one of those experience for themselves! So, if I shared some of the things that have happened at his place while I have been there, you would probably remember him with no help (destruction of “unwholesome movie” incident, brother eating chapstick and so forth). His baptism was awesome and he definitely made it better too, ha ha. His Grandma & Uncle taught on Baptism & the Holy Ghost and he made some remarks while his Grandma was doing an object lesson to describe the importance of the Holy Ghost – what she used was a blanket for the comforter, a flashlight to describe that it is the light in our lives, a compass to show that he can guide us and direct us in the right direction, and a print out of a stoplight to describe how it can warn of dangers, stop us from doing anything stupid, and give us the green light to go do the right thing. It was a great talk, but when she was talking about the compass and how the Holy Ghost only leads us up towards Heavenly Father, Alonzo bursts out and says “You mean so the compass can’t go south? What do I do if I need to go south? !”, and when she was presenting the stoplight to him (because got to keep everything she used in her talk), he in response said, “That’s ok you can keep it if you like; I already have enough things.” When his Uncle was talking and mentioning how proud he was of him that he was about to get baptized and make promises to God he out of nowhere say’s, “What’s a covenant?” Elder Mayo and I were in the back trying to keep it together, but with it being Alonzo and us knowing the way he was we were laughing like crazy, ha ha. That was the baptism experience, but there was one last one that we had where we drove by this black guy who waved us down because he needed some help – so we drove back and talked to him to see how we could help him out. He was actually a salesperson from D.C. that needed to call his boss so that he could get a ride. We kept on talking to him and he showed us what he was trying to sell (a cleaner), and the way he advertised – it was just funny altogether because of the way he did it. He first sprayed some in the air, sprayed some on his hand, and then sprayed some in his mouth (yes, in his mouth). He told us that there were no chemicals, it was made from all natural ingredients, and it even tasted good on things like chicken too. Odd right? I don’t think that I will ever be able to find a cleaner that works as good and tastes as good as the one he had! Well people, I love all of y’all and hope that you continue to take care of yourselves!